This attractively Engraved Compact is the perfect engraved gift for her. Personalize our Engraved Compacts for your Mom on Mother's Day or the entire bridal party. Your mom or daughter will love receiving this Personalized Compact as a unique Graduation Gift. Our Engraved Silver Stone Compact measures 2 3/8" square. 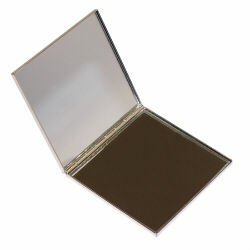 The Engraved Compact features two mirrors located on the inside top & bottom of the compact. Engraved Compact includes FREE personalization! 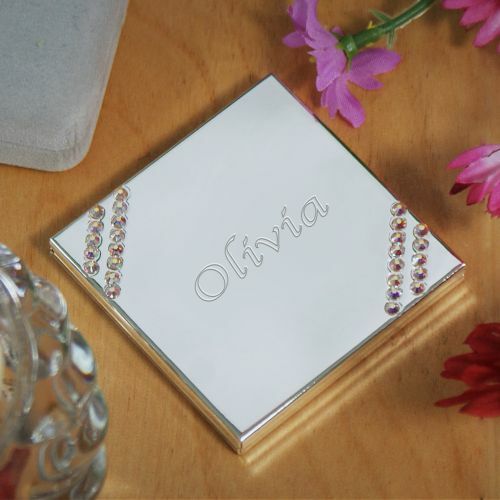 Engrave your Silver Stone Compact with any name or initials and an optional 2 line custom message. It was beautiful. No mistakes. My aunt loved it! I was very happy with the compact! It came out great and is a perfect "special" gift because it is personalized with whatever you want to say on it! Additional Details GiftsForYouNow.com offers many great Personalized Gifts Under $20 for Mother’s Day that your Mother or Grandmother will cherish for years to come. We have an extensive collection of Personalized Mother’s Day Frames, Personalized Mother’s Day Shirts & Personalized Keepsakes. Place your favorite Poem onto one of our Personalized Mother’s Day Poetry Gifts or place your favorite Photo onto our wonderful Personalized Photo Gifts.